How many times have you gone to a website to learn search engine optimization (SEO) tips only to be overwhelmed by the way it is written? You think to yourself ‟Like really people, I’m not a professor”. Never mind the fact that you need a coder just to implement it. There are several resources where you can learn advanced SEO and improving your website but to keep it simple, efficient and actionable let’s start with what is the best of the basic SEO strategies to rock your website. What you will find below are 12 of the must do, actionable, and easy to implement tactics I’ve taught to other business owners that really made a difference for their sites. No sugar coated tech jargon here just tactics you can use to help explode your visibility in the search engines. Grab a beverage and let’s get those customers that need your services/products. Keyword Shitter, I know it’s a funny name but trust me it’s awesome! For a onetime payment of $149 Market Samurai is a nice choice. There is also a 30 day free trial with MOZ where you can use the Keyword Explorer tool. With this list of keyword tools you now can find many search terms you would’ve not thought of. You can even create new terms from the list these tools produce. The exemplary Page Title format is: “Keyword1 | Keyword2” it is best to use your top keywords that help explain what the page is about. Another method to write them would be like I used in this post: “11 Basic SEO Tips | SEO Tips for Beginners”. Meta descriptions are not a ranking factor nor are they crawled by the search engines but are in fact great for attracting eyes to your listings which in turn is rewarded with a click. These should be around 150 characters or less and should be descriptive using your best keywords. When a person types a keyword into the search box and hits enter if you optimized your tags right their keywords will be bold in the Page Title and Meta Description which will help entice the user to click your web link. This is a really good tool to help create Meta Tags, Meta tag generator. Good Video about Meta Tags YouTube Tutorial. Since the online world is ruled by Google, using their social media channels in conjunction with your website is a must. Simply go to Google My Business Fill out the short form to claim your business. Once done they will send you a card in the mail with your pin #, use that pin to verify your page. Now you can start uploading all your info about your business. Use the categories and also upload at least 5 photo’s preferably of you and your business, and if you can GEO tag them. Always put a link back to your website. Once all info is uploaded you now can start posting to it like any other social media channel. There is a lot of buzz about this being a ghost town but trust me it has a lot of SEO value for your website. In simpler terms it means to link from a page/post to other pages/posts on your website. Link to a page/post that outlines your services to individual service pages that you would like to rank. For example, “We can develop, design and optimize your business’ websites.” Optimize would link to a page about SEO. • The links need to make sense and match what the content is about. Editing the sitemap can sometimes be challenging but with a developer’s help it is usually a quick job sometimes within an hour. Some web developers even include this in their build. Google Search Console is where you can submit your XML sitemap to help Google crawl your site faster. A really good WordPress plugin we use is Google XML Sitemaps. This plugin will generate and submit your XML sitemap for you. Image filename and Alt Text are very similar to Meta Tags, you should customize the text by including your keywords into the filename and use the Alt Text with a different set of keywords to describe what the photo is about. Before you upload your images be sure to use keywords in the filename that bests describes it. 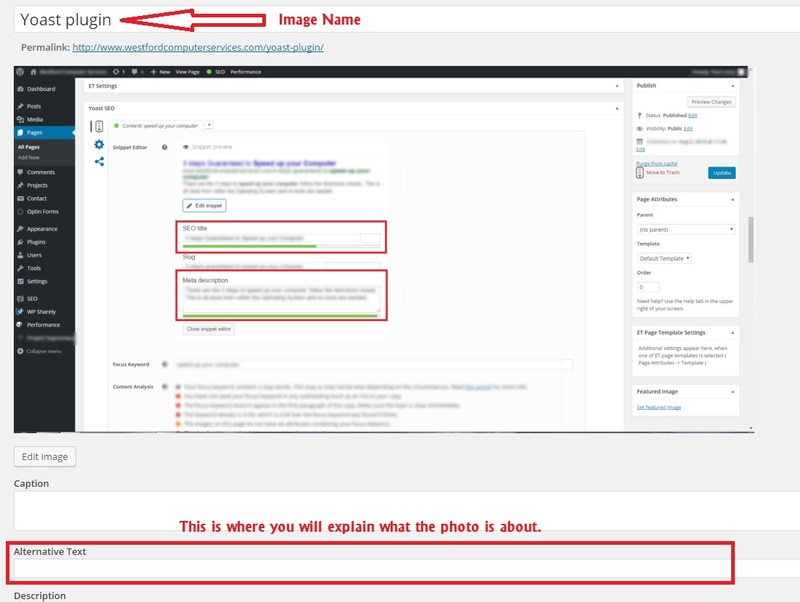 An example would be, below in the images the filename is alt-text-optimization-WordPress for the image. Now the Alt Text, incorporating your keywords you had found from Tip 1 you want to best describe the photo as text to voice readers and search engines use this information. External linking building is very similar to internal linking. Use the keywords from Tip1 and implement them into the rich anchor text. Make sure they make sense with the content and that they are relevant links. Keep a moderate linking count within your pages. The difference with internal linking and external linking is internal is within your own website and external is linking to another source out on the internet. Pro tip: use this code within the Code so that when the link is clicked it will open in a different window. It amazes me how many people have their links open in the same window. The problem is now your customer is off your site and may very well forget about going back to your site. Most pages now-a-days are designed to automatically incorporate the title of the page into an H1 tag. Search engines use the H1 Tag as a strong indicator of what the page is about. In your title be sure to use your best keywords relevant to the page and your business. Also use your keywords in the body of content preferably within the first 100 words and maybe 2 more times in the rest. Take advantage of the H2 and H3 Tags also but make sure to alternate your keywords as to not over optimize your page. Some very simple ways to get external links to your website is to submit them to directories like Factual, InfoUSA, Acxiom, DMOZ, Google, Yahoo and Bing. Beware of link brokers that are willing to sell you links as it can do real harm to your business if it is done using so called Black Hat link building techniques. There is a time and place for these type of techniques and if you don’t know about them I believe you should leave it to the pros. These practices can really close the doors on a business so be careful. Pro tip: Using Google Alerts can help you find websites that mention your company like in a press release or in the news but don’t link back to you. It’s simple, make sure you write content that is unique to your website. (Unpopular with search engines) Copying other content from another source is considered duplicate content which is taboo to the search engine gods. Performance can suffer as a result of using content that has already been published somewhere else. The Engines love new and fresh content as it has something of value to present to its searchers. The best way is to have a blog for your website updating it regularly and you will please the gods… and in turn they will reward you with better rankings. CTA might be a button on your webpage like: ‟See More” ‟More Info” ‟Contact Now” ‟Call Now”. Each page should have some type of call-to-action, not having one is potentially a loss of a sale for your business. Providing too many options can also be bad for conversions as it distracts the user. Think information overload, I don’t know about you but when I’m overloaded I usually bounce off the site. The purpose of Schema has many differences in opinion from top SEO experts of what it actually does. Well here is my explanation; Search engines and other platforms that use this encoded data, use this to boost their users search experience. Webmasters usually create what is called ‟mark-up” which helps search engines highlighting key points within the data. If these platforms understand the markup on a webpage, in most cases it will add rich snippets and other features to your search results. An example is a restaurant could use this code to have reviews and price snippets appear in search results. Schema.org is the best place to learn these vocabularies such as Microformats, RDF and Microdata. Tagging the data on your webpage is also an alternative, using a tool like Data Highlighter. Most of the work you can do yourself using schema generators and also schema plugins but if you feel it’s over your head then you can hire a web developer. Helping the search engines understand websites is what schema is mainly used for and is the latest trend in SEO. By adding more information using schema you are able to have product reviews, links, additional text, addresses and more show up in search results helping capture the searchers attention to your listing. First – choose what type of webpage that you want to mark up. Second – use the URL by simply copying your webpage address into the field or copy and paste the HTML code you want to mark up into the HTML field. Third – create the HTML and upload it to your webpage or have your developer do it for you. Keep in mind that there are times that all the code can be right but may not show up in the search results. Search engines can be finicky if it’s not exactly relevant to the searchers query. If you choose to implement any of these tips it may be wise to create a baseline to compare against. Also Review performance using such tools as Google Analytics Annotations by placing notes on a specific dates aiding you to compare to the baseline. You can also use the free version of Pro Rank Tracker to monitor your search engine rankings. Now that I’ve laid it out how to implementing basic SEO tips, I want to hear from you! Which of these techniques in this guide are you going to implement first? Do you have any questions about any step in this guide? As always, when in doubt just reach out to me.